Sunday Funnys: What’s in a name? Some days a blog post just falls into your lap like a class assignment that gets sent home from school. 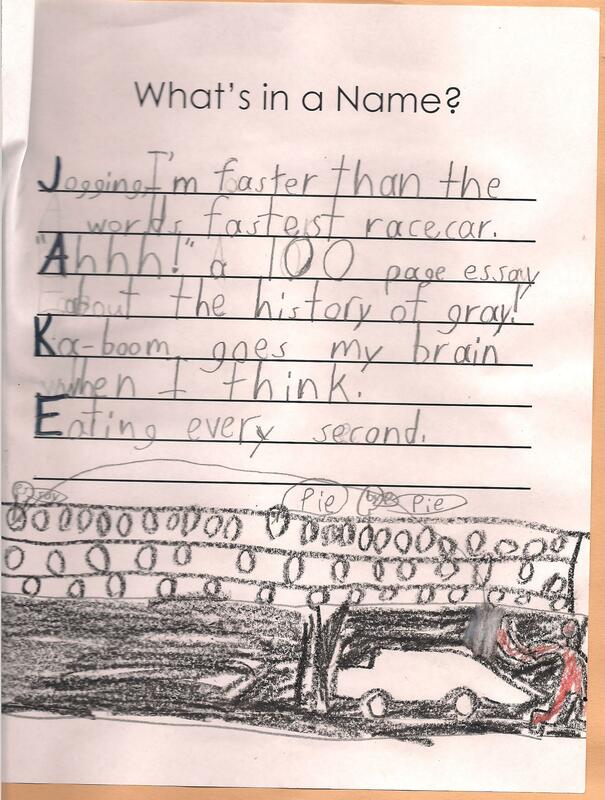 Below is my son Jake’s class work to creatively use the letters in your name to describe yourself. They were given a space at the bottom to add in a picture. Jake has offered up his artistic abilities for today’s blog post to give even more meaning to his descriptions. So without further ado … I give you What’s in a name? Very cool – he is a creative child. I actually read some breakdowns of our kids learning styles and Jake falls into the creative thinker category. The history of gray? I’m at a total loss here, may be a combo of something he heard from school and the books he’s reading. Speaking of books, we were reading Hank Zipzer tonight. Do you know that series? BR really likes them. He also has read everyone of the Weird School series. What’s Jake into? I haven’t heard about those books. I’ll check them out for Jake. He use to read Capt Underpants but I found a way to shift his attention and now he’s reading the Percy Jackson series. There’s monsters, battles and a big war going on … its awesome stuff for a boy. I think that might be a more mature level than where BR is though I have it on my radar for the future. Jake’s reading on a 4th grade level. These books have a lot of big words but he seems to be working through it. My favorite thing is that he’s so into the stories that it’s improving his comprehension skills. I am not worried about the reading level – thankfully, he is strong there. I am more interested in the content. These books were recommended by the librarian and I’ve read some of the books out loud so the content is really engaging. He’s already on the 3rd one and going through these quickly. Not sure where to go for the next series of books for him to read. Suggestions? There’s some fighting and because its this mythology stuff, people don’t just die. They kinda disappear and go into this mythical land of Hell/Underworld. It’s very much like a kid version of the Clash of Titans. I love the sarcastic Ahhhh about writing an essay on the history of gray…very funny! It’s always great to go through his school take home folder. I find the funniest stuff. OMG HOW CUTE!!!! I can’t wait to get these again! My Refrigerator looks so lonely! I know, my fridge is covered. How old are your kids? KK is 13 so no more art but Oliver is 3 and he will hook me up! How about you? Winston wants SO BADLY to give you some of his art work! I bet he’s dying to prove him self to you LOL! Wouldn’t that be funny …. like paw prints in different colors in the shape of a turkey? « Have I been moving towards balance and didn’t know it?